Dr. Sunshine, Medical Director at OC Sports & Wellness recommends fitness testing for all of his patients. Clinical studies have shown that fitness testing is the simple best measurement of health. We asked Dr. Sunshine why he offers fitness testing in his medical office and to explain the benefits of fitness testing. Dr. Sunshine: Fitness testing is a valuable tool we use to assess a patient’s health. No other test provides us with as much information about a person’s health status as fitness testing. How is fitness testing performed in your office? Dr. S: We can test patient’s on a treadmill, stationary bicycle or on their own road bike. We ask patient’s to come in wearing their work-out clothes prepared to break a sweat. The patient undergoes a basic cardiac examination and then EKG leads are placed over the front of their chest. Patients then undergo an easy warm-up on the treadmill of bicycle. Next, a mouthpiece is inserted and secured and a nose clip is applied. This method allows us to accurately measure oxygen consumption during exercise. The patient’s vital signs including heart rate are measured at regular intervals while the exercise intensity is incrementally increased. The testing is concluded once the patient has reached their maximum heart rate or maximum volume of oxygen consumption. How are the test results utilized? Dr. S: The information gathered from the testing allows us to categorize each patient as being in excellent, good, fair or poor fitness. The information also allows us to create an exercise program that will help improve a patient’s fitness over time. Our exercise prescription is very precise and personally tailored to the individual based on their testing results. Why is “fitness” such a valuable marker of health? Dr. S: Clinical studies have shown that those patients who are most fit have the highest quality of life, are taking the fewest number of medications, have the lowest rate of chronic disease and the longest life expectancy compared to those who are un-fit. How often should someone be tested? Dr. S: For patient who are the most fit, I recommend annual testing. 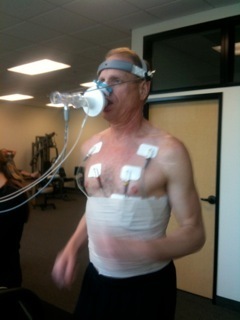 This allows us to determine whether a patient is maintaining their fitness level. Those who are un-fit should undergo more frequent testing to determine if their exercise program translates into improved fitness. Does health insurance cover the testing? Dr. S: Yes, the testing is billed through the patient’s health insurance. Those patients with no deductible or who have met their deductible with only incur the cost of their co-payment.